You'll be £12.00 closer to your next £10.00 credit when you purchase Cheerful Sacrifice. What's this? Cheerful Sacrifice tells the story of the spring offensive of April - May 1917, otherwise known as the Battle of Arras. Probably because the noise had hardly died down before it started up again with the explosions at Messines, shortly to be followed by the even more horrible Third Ypres - remembered as Passchendaele - the Battle of Arras has not received the attention it deserves. Yet, as the author points out, on the basis of the daily casualty rate it was the most lethal and costly British offensive battle of the First World War. In the thirty-nine days that the battle lasted the average casualty rate was far higher than at either the Somme or Passchendaele. Jonathan Nicholls, in this his first book, gives the Battle of Arras its proper place in the annals of military history, enhancing his text with a wealth of eye-witness accounts. One is left in no doubt that the survivor who described it as 'the most savage infantry battle of the war', did not exaggerate. Nor can there be much doubt that the author is destined to rise high in the firmament of military historians. 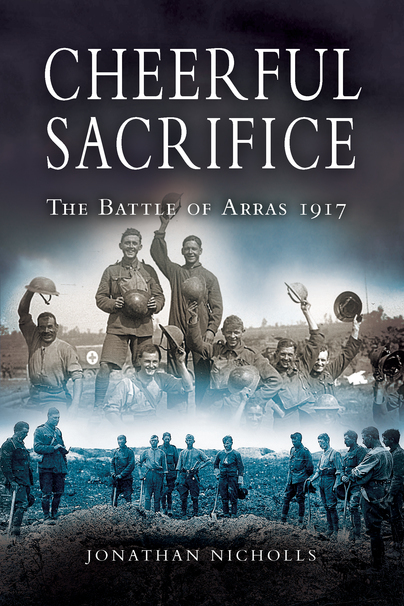 In Cheerful Sacrifice Jonathan Nicholls presents an enthralling account of the battle of Arras, the most lethal and brutal offensive of the British Army in the Great War. Drawing upon historical records as well as personal accounts from both sides, Nicholls outlines in harrowing detail the victories and losses that marked the shifting tide of the battle. Nicholls succeeds, where many other authors have failed, in combining these different source materials to create a comprehensive and detailed overview of the battle, while also instilling within the reader a chilling sense of the human cost. This title represents an important read for not only the military historian, but anyone who seeks to comprehend how the sacrifice of a generation shaped our world.